Indigo Airbus A320neo VT-ITC. Copyrighted image. Re-use prohibited. India’s largest domestic airline IndiGo, reported its first quarter results for the FY2017. With earnings of Rs 591.8 crores, the results yet again failed to meet analysts’ expectations bringing down its stock price from Rs 994.9 on August 1, to Rs 865.2 on August 3, 2016. For the first quarter of fiscal year 2016-2017 (FY2017) which ended on June 30, 2016, IndiGo carried a total of 9.85 million passengers, only a 20% increase as compared to same period last year. The airline increased its capacity (measured in Available Seat Kilometers) by 25%, outpacing the passenger growth. This presumably resulted in passenger load factors declining by 4.6% to 83.3%. During the quarter, the airline operated 70,064 flights, a 24% year-on-year increase, for a total of 129.9 block hours. Increases in stage lengths resulted in an impressive aircraft utilisation of 13.3 hours a day. Thus overall capacity impact is greater considering both the higher aircraft utilisation and fleet additions. This aggressive capacity induction is concerning, especially in light of the new National Civil Aviation Policy (NCAP), following which we can expect an accelerated capacity growth in the industry. Overall the on-time performance (OTP) for the quarter came in at 85% which is impressive given a fleet of 109 aircraft. With new regulations around OTP set to become effective in the second quarter, the 85% OTP will have to pushed to reach 90% targets given the heavy penalties for delays, denied boardings, and cancellations of the new regulations. Passenger revenues came in at Rs. 3,972 crores, a 6.6% increase as compared to last year, even though passenger volumes increased by 20%. This was primarily due to increased pressure on the yield, bringing down average fare by 11.1%. Amidst increased fare pressures and lower load factor, performance measured in Revenue per ASK (RASK) declined by 12.7%. Consequently, the operating profit per ASK suffered a huge decline of 34.4% even though the company reported an improvement in its operating cost. Cost per ASKM (CASK) declined by 6.3% mainly attributable to lower fuel cost as compared to the same period last year. As the competition will increase in the future given the new NCAP, IndiGo’s yields as well as load factor are expected decline further in FY17. While, the airline will continue to report positive results, increasing fuel prices and a strengthening US Dollar will further impact the net profit. It is notable that, finance cost per aircraft increased by 43.6% even though the company claims to have retired debt amount of Rs.258.9 crores. Overall, the profit margins declined with earnings before interest tax depreciation and amortisation (EBITDA) margin coming down to 32.9% as compared to 37.1% last year. Earnings before Interest and tax (EBIT) margin reducing down from 19.9% last year to 14.7% this year, and net profit margins showed a 1.4% decline. Indigo CEO cited intense competition as a reason for fare declines and the average fare was 10.9% lower as compared to the same quarter in the previous year. RASK was 12.7% lower which was a combination of lower revenues and higher capacity in the system. With airlines such as Tata-SIA Vistara, AirAsia and GoAir also planning capacity inductions, fare wars are inevitable. 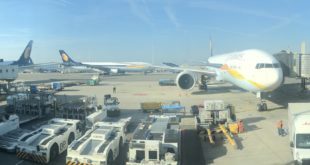 Given the price-sensitive nature of the Indian travellers and the “me-too” attitude of the Indian airlines, it will only take one announcement of a fare sale before the industry finds itself in a downward spiral. The decline in domestic yields can be compensated by International operations, yet Indigo’s international presence is limited and its segment revenue for International came in at Rs. 375 crores, only 3.3% higher. 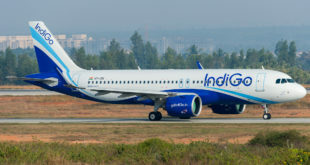 International operations will likely be a focus area for Indigo and it is likely that Tier2 cities are used to connect to overseas points – starting with Bangkok. 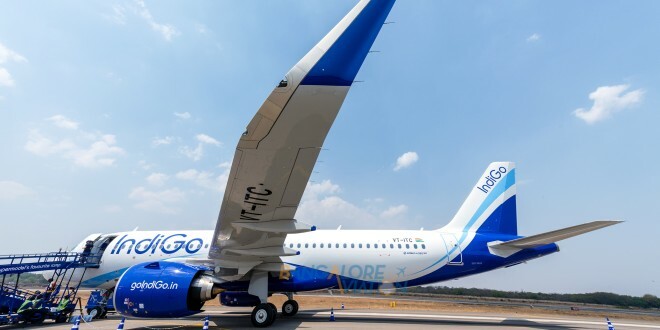 Indigo indicates that it now has much more data on NEO performance and that the NEOs are giving 14.3% fuel savings compared to A320 without sharklets. Operationally NEOs continue to be a challenge and assuming all A320 NEOs are received in this fiscal, Indigo will be operating 24 A320 NEOs by the fiscal year end of March 31, 2017. The NEOs will then represent 18% of total fleet assuming no existing CEO airframes being returned. 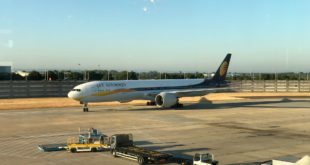 This announcement is significant as it hints that Indigo could be considering a less aggressive stance on capacity induction. This quarter’s results do not include the impact of new regulations that come into effect starting July and August which limit the cancellation charges; provide for increased compensation for delays and cancellations; and provide for limits on excess baggage charges. These regulations and resultant financial hits will impact all airlines hard, but with its 38.1% market share and reliance on value added fees, Indigo will be especially hard hit. Slight network readjustments may also be likely to increase network reliability and limit pay-outs. Sources indicate that the new policies are being contested with regulatory and other channels by Indigo. Indigo continues to be a profitable carrier and to achieve a consistently profitable streak in Indian markets is an notable achievement. However, the public expectations continue to be sky high and will have to be tempered and managed given that the profit streak cannot continue at previous levels.